Photo by Lewis Hines, who was documenting the poor living and working conditions of children. I found the photo at this site. Another article about how healthy it is to live in an urban environment in which you must walk a lot. This kind of article is appearing more and more often. Of course, when many families choose a suburban life, they make a clear-eyed choice: to sacrifice the adults' health and well-being (with a longer commute, fewer cultural attractions, etc.) for the children's well-being. The suburbs are presumably built with children in mind -- with crime-free residential neighborhoods, backyards and cul-de-sacs to play in and better schools. 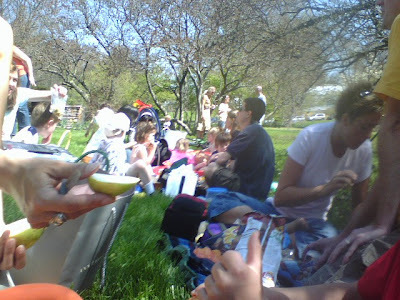 But studies have shown that the new suburban realities may be affecting children's health as well. An estimated 20 percent of school-age children are obese. And only 13 percent of children walk to school, compared with 66 percent in 1973. Sometimes even those playful, active creatures for whom the suburbs were made find themselves stranded like commuters on a long ride to an unhealthy adulthood. One pet peeve of mine is the innanity of playgrond equipment. Gladly I am not the only one who sees the senselessness of a completely safe playground with no see-saws and swings with three foot long chains. Here is a portion of a lengthy article from the Boston Globe on current thinking about playground design. Read the whole thing. The article is a Must-read. "There's a real international playground movement taking hold around the world, and it's really very exciting," says David Elkind, a professor of child development at Tufts University and author of the recently published book "The Power of Play." Nor is it only celebrity designers and architects who are starting to take playgrounds seriously. Here in Boston, a public-private partnership called the Boston Schoolyard Initiative has over the past decade refurbished 61 of the city's schoolyards, furnishing formerly neglected spaces with play structures and greenery. Recent years have also seen the creation of nonprofits, like the MetLife Foundation Parks & Playgrounds Fund and KaBOOM!, dedicated to improving children's access to playgrounds. KaBOOM! has partnered with Home Depot and Kimberly-Clark and earned the endorsement of Senator Hillary Clinton in its mission to provide "a great place to play within walking distance of every child in America." This pro-playground vanguard, according to the child psychologists, designers, architects, parents and teachers who form it, is motivated by the conviction that play, in a larger sense, is under attack. High-stakes testing has elbowed recess out of the school day, video games keep kids indoors and sedentary, while parents, fearful of pedophiles and abductions, no longer let children roam freely. All in all, the average child's life is more regimented than it was 20 years ago, with more young children in day care, more lessons and rehearsals and practices, and less free time. The fact that communities are getting serious about play, proponents hope, means leaders recognize the extent to which it is endangered in modern society. At the same time, this reexamination of playgrounds is triggered by the conviction that, in the United States in particular, playgrounds have become rather unfun -- designed with only safety in mind, they've lost the capacity to excite or challenge children. Playgrounds have always been places where the need for free, even rambunctious, play bumps up against parental fears about safety. The new playground advocates are trying to find a better balance. "The history of playgrounds," says Roger Hart, director of the Children's Environments Research Group at the Graduate Center of the City University of New York, "is a history of containment." 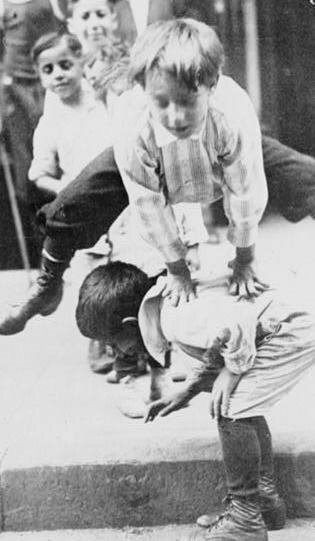 The country's first permanent playground, in New York City's Seward Park, was built in 1903 for children from the nearby Lower East Side tenements. 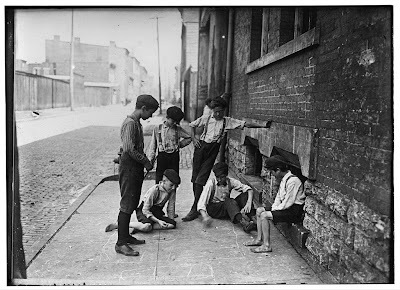 According to Adrian Benepe, commissioner of New York City's Department of Parks and Recreation, early American playgrounds "grew out of social workers trying to provide safe places in overcrowded slums." Tenement children played in the streets and on piers, sometimes being run over by streetcars, sometimes drowning in the East River. But what concerned the Progressive reformers as much as children's safety, according to Roger Hart, who was also a consultant to the Imagination Playground, was the thought that by running wild in the streets, immigrant children weren't learning the sort of values that would make them upstanding, hard-working Americans. "There was this ideological split between those who argued that children would learn what they needed just by playing in the streets, and those who wanted to put them in playgrounds," Hart says. The Seward Playground wasn't very different from what we think of as a playground today. With structures to swing and climb on and a running track encircling them, it served as a model for decades. Safety concerns eventually remade the playground, according to Susan Solomon, an architectural historian and author of a history of American playgrounds. In recent decades, she argues, fear of personal injury lawsuits has shrunk the playground. Slides and swings today are lower, and therefore slower, than before. Raised platforms are girded by railings, and monkey bars are practically nonexistent. "The see-saw today," points out Solomon, "is pretty much a horizontal bar that hardly moves in either direction. It just kind of jiggles a little bit." School playgrounds in Broward County, in south Florida, now post "No Running" signs. Project for Public Spaces put Teardrop Park in it's hall of shame for it's isolation and hidden places. Wikipedia entry on Teardrop Park. 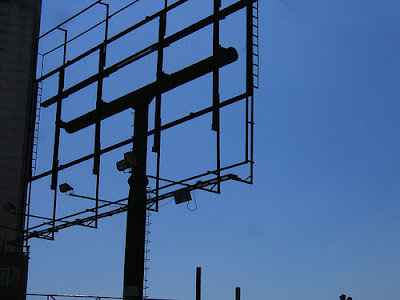 In the city we are surrounded with outdoor advertising. From bus-stop benches (which a councilmember wants to abolish in Cincinnati) to flashing lights and the blare of the ice cream truck. In Sao Paulo, I saw an article in which they have banned large outdoor signage. I have mixed feelings about this. I enjoy city life, and that life includes a bustling commerce. I don't want to change the city into a replica of a quiet small town, or a tranquil park. On the other hand, I don't want flashing lights and loud stereos comming in through my window either. It is futile to try to evade the issue of unsafe city streets by attempting to make some other features of a locality, say interior courtyards, or sheltered play spaces, safe instead. By definition again, the streets of a city must do most of the job of handling stangers for this is where strangers come and go. The streets must not only defend the city against predatory strangers, they must protect the many, many peaceable and well-meaning strangers who use them, insuring their safety too as they pass through. Moreover, no normal person can spend his life in some artificial haven, and this includes children. Everyone must use the streets. -from The Death and Life of Great American Cities, page 35-36. We got a notice yesterday from our son's school, that because of budget cuts the art, music and gifted student teachers will be cut to half time. This is a result of less money coming to the public schools because of the State voucher program (Ed Choice) and because of falling enrollment in Cincinnati Public Schools in general. Some argue that the state should create an Education Tax Credit Program. I'm all for choice in schools. Fortunately for us, CPS offers lots of choices in their magnet school program, and we did not need to pay for private school choice. If we had gone that route, a voucher was available for us, since our neighborhood school is in academic emergency. We had a wonderful day for the parade. Beautiful blue sky. Tons of kids lining the streets watching and playing on the sidewalks. I wish it could be like this every day. Thanks to everyone who visited. I didn't have time to take photos, which I really wanted to do to.